Next time you're playing a game at your local club or store, before you set out your models or decide a mission to play, stop for a moment and take in the scenery on the table. Just soak it in, have a good look at what's on the table, then raise you head and look around at the other tables, all full of scenery. Someone took the time to build that scenery for you to play on, they spent hours putting it all together and painting it up, they may have even contributed to it with their own materials or bitz from their bitz box. The reason I'm mentioning this it because in most clubs and stores, the scenery is taken for granted and as such treated horrendously. I've seen gamers just pile their army cases on to of it, I've seen it broken by clumsy and over eager gamers, I've even seen it broken purposely to get models to stand up properly! Don't place your army cases on top of the scenery, you wouldn't like an army case on top of your army. If it gets broken, 'fess up, accidents happen and it's far easier to fix when the break is fresh and you have the part that broken off. If you have to pack it away, then treat it like a friends army, don't just throw it in a box in a rush to get packed away. Take the time to find out who made it, and if they're there, thank them, making scenery really is a thankless job. Just follow those guidelines next time you're at the club and you might find that your scenery looks good for longer and you might even find that the guy behind building it builds some more rather than weeps over what's been done to his work. Amen to that. 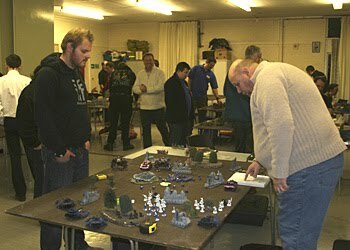 I play at a club which has 35 beautifully modelled tables (better that Warhammer World's ones any day) and we always make sure that the three dudes who make them get bought beer after beer. Tis only fair! Great advice Col Corbane. While the terrain at my FLGS is certainly lacking, it wouldn't be there at all without someone dedicating the time make it. They deserve credit for the effort, and it shouldn't be abused by carelessness. Great article, I heartily agree as I have been a part of the creation of a large portion of the terrain in my store. It hurts me a little inside to see random broken pieces scattered throughout the store. Thank you! I make plenty of terrain for my local games store. Its not a very good community, the people there are very disrespectful. And not many people are really that passionate about the hobby. I like to make the terrain for myself, so I have nice terrain to play on for my carefully painted armies. And I decided to let the general crowd use it, as a generous gift. But before I built terrain for the store most of the other stuff was broken or damaged. And now I'm starting to put away the terrain, so that its off limits for anyone but me, my friends and people I let use it. Its absolutely true, we spend a lot of time, effort and money (our own money) making the terrain, its only fair that one does treat it with respect, even if one doesn't know the person who made it. Finally, I've been spending so many hours painting and painting the terrain for my shop, luckily for me, the crowd at my place do appreciate the terrain I make. Some of my friends even bought terrain from the shop to let the shop have it. Basically I have to assemble and paint them all. Oh well. Tough life. Great post - the lack of respect for other peoples property is something I've noticed everywhere in life, not just in wargaming - weren't we all taught to respect other people and their things when we were kids? well said. it is nice to see other people pointing out that this stuff shouldn't be expected but appreciated. some one puts alot of work and care into these things and then just lets you use them no strings attached. that doesn't happen in like any other hobby. and those people willing to give their time and money and creativity to make terrain should always be thanked and respected. Thanks for this. As a club terrain builder, it's infuriating to see terrain treated badly, and finds parts broken off it only a week after you've painted it. There definitely needs to be a "Real Men Of Genius" advert about you all!